These increases are nearly identical, but the right leaning increase is a forwards loop while the left-slanting increase is a backwards loop. (These increases are really just subsets of the forward and backward looping-on casting-on described in a previous post. However, instead of casting-on an entire row of foundation stitches, only one stitch at a time is being cast on, to serve as an increase.) These kinds of loop increases are often called an m1 (make-1) although, in truth, there are LOTS of different increases called an m1. (Above) The fabric in this picture is growing to the right because the increases are being made very near the fabric's right edge (one stitch in from the edge, actually). The increases are right-slanting ones, which means that they lay smoothly and do not leave a bump on the fabric surface when used to make an increase by the right edge of a knitted fabric. 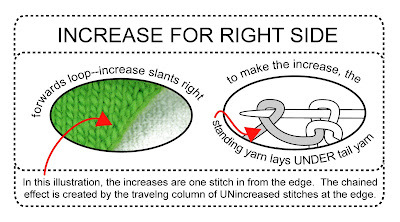 This right-leaning looped increase is made by twisting the standing yarn UNDER the tail yarn (in this illustration, the tail yarn=yarn coming out of the immediately preceding stitch). The loop which results from twisting the standing yarn under the tail yarn is called a "forwards" loop because the loop lays on the right needle right arm forward, just like a regular untwisted stitch does. In other words, if you compare the right-leaning increase to the ordinary stitch sitting beside it you will see that both lay right arms forward. (Above) The fabric in this picture is growing to the left because the increases are being made very near the fabric's left edge (one stitch in from the edge). The increases are left-leaning ones, which means that they lay smoothly and do not leave a bump on the fabric surface when used to make an increase by the left edge of a knitted fabric. 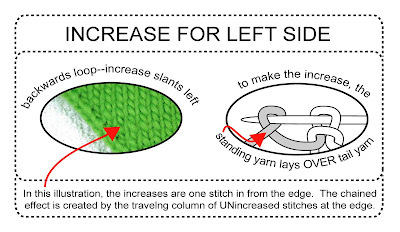 This left leaning looped increase is made by twisting the standing yarn OVER the tail yarn (in this illustration, the tail yarn=yarn coming out of the immediately preceding stitch). The loop which results from twisting the standing yarn over the tail yarn is called a "backwards" loop because the loop lays on the left needle "backwards," like a twisted stitch would. Compare the left-leaning increase to the regular stitch sitting beside it--the regular stitch is right arm forward, but the increase loop is left arm forward. The easiest way to make both of these increases is to pinch the standing yarn between your left thumb and forefinger, twist it into the kind of loop you want (per illustrations above) and then place it onto the right needle. Initially, you may find knitting (or purling) into looped increases awkward. Like all looped-on stitches, looped increases--whether left- or right-leaning--want to shrink and stretch and share yarn with the surrounding stitches. If you're really having a hard time skewering those loops with your right needle when you come to them in the next row, cheat a little, and knit (or in flat knitting, purl) into the back loop instead. I made two long samples--one flat knit and one circular knit, and could see only the most subtle difference between working into the front loops or working into the back loops, so do whatever you'd find easiest. With practice, knitting into these awkward little thingies will become one more of your "mad knitting skillz" (as the 8th graders like to say).